It is time. You can’t be a food blogger that grew up with an Italian grandma and not have a thing for lasagna. 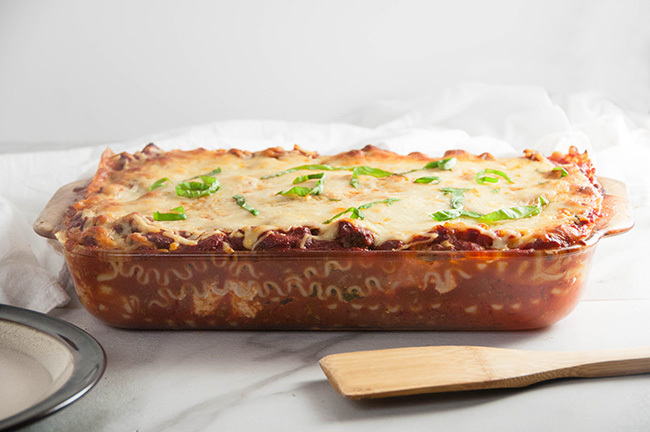 Actually, you can’t have a drop of Italian blood and not have a thing for lasagna. It’s like a law that lasagna appears on the table of almost every Italian American holiday gathering. So without further ado, I bring you my recipe for gluten free lasagna. At any holiday that my Grandma attended while I was growing up, there was always a lasagna. It didn’t matter if it was Thanksgiving and there was a full turkey dinner on the table. There was a lasagna. Christmas, there were two. And Easter, I’m fairly certain we didn’t do the whole ham dinner. Nope. We had lasagna and Easter bread. I told you. It was law. So now that I’ve been working on this little piece of the internet for almost a year and let both Thanksgiving and Christmas and shared a Parmesan Garlic Twice Baked Potato Casserole and a Gluten Free Cranberry Apple Crumble and no lasagna, I had to fix that. Law ya know? 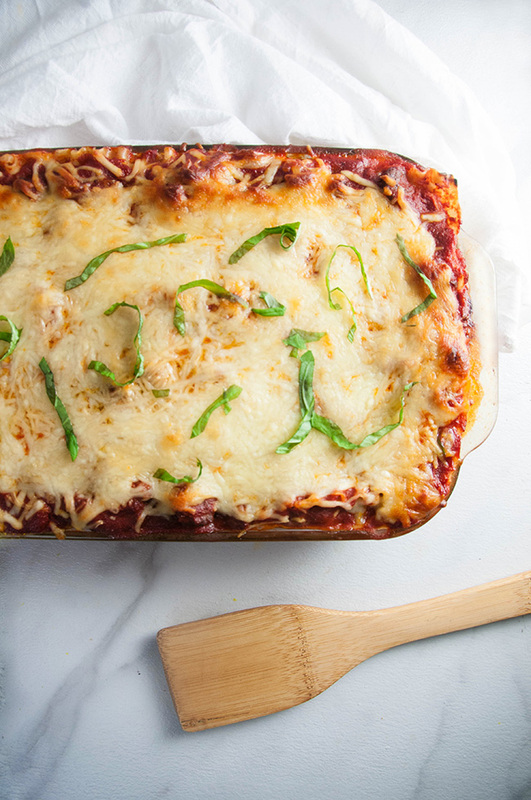 Lasagna gets a bad rap for being super complicated. Shocker: it’s really not that much harder than making a quick spaghetti with meat sauce. 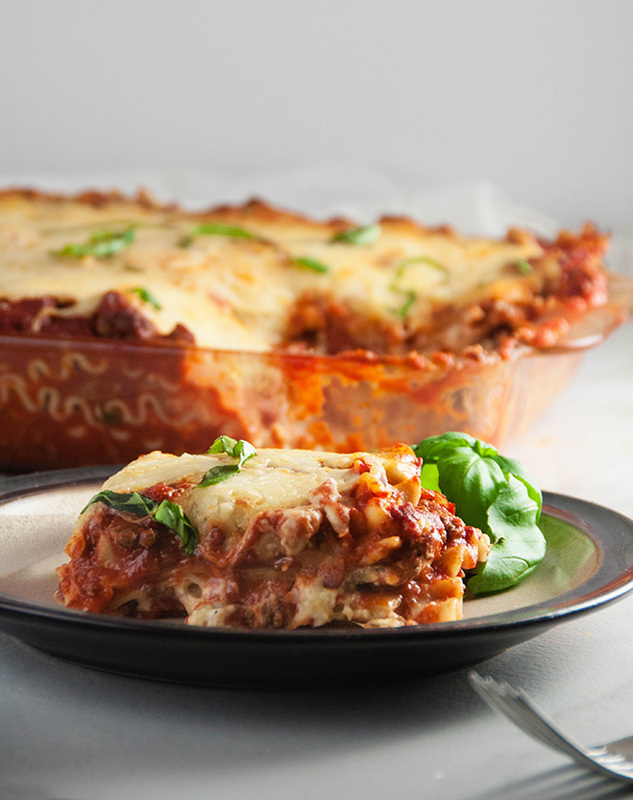 There are three extra steps: mix the cheese layer up, and then actually layer the lasagna. Last, just toss it in the oven and bake it until the cheese is super melty and delicious. That’s it. Really not too difficult, so don’t be intimidated. My 2 year old actually helped me put this lasagna together. She likes to drag a kitchen chair over to the stove while I cook and “Tir it!” (Translation: stir.) And, indeed, she did stir the sauce and the cheese. In fact, Goose added her own special flare to this lasagna. In my infinite mommy wisdom, I left her at the kitchen table, stirring the ricotta cheese while I went to drain the lasagna noodles like 4 feet away from her. What could go wrong, right? I come back and there was a HUGE pile of Parmesan cheese on top of the lasagna. I had been trying to teach her that I like to taste the cheese as I mix it (before I add the egg) to check for seasoning. Well, Goose had stuck her finger into the Ricotta, and decided that I had not added nearly enough Parmesan to the mix. Smart kid. Knowing how delicious cheese is. 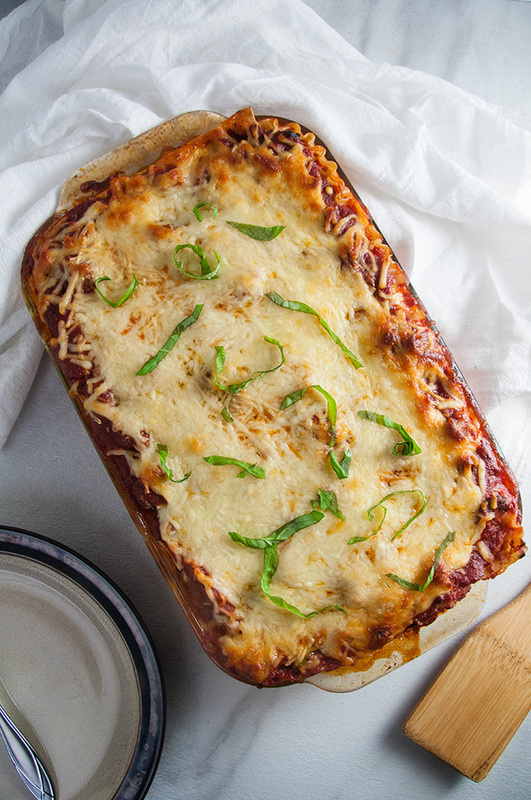 So yes, this lasagna is extra cheesy, but it is extra delicious. It totally makes up for the fact that I didn’t make my own lasagna noodles the way my grandma used to. 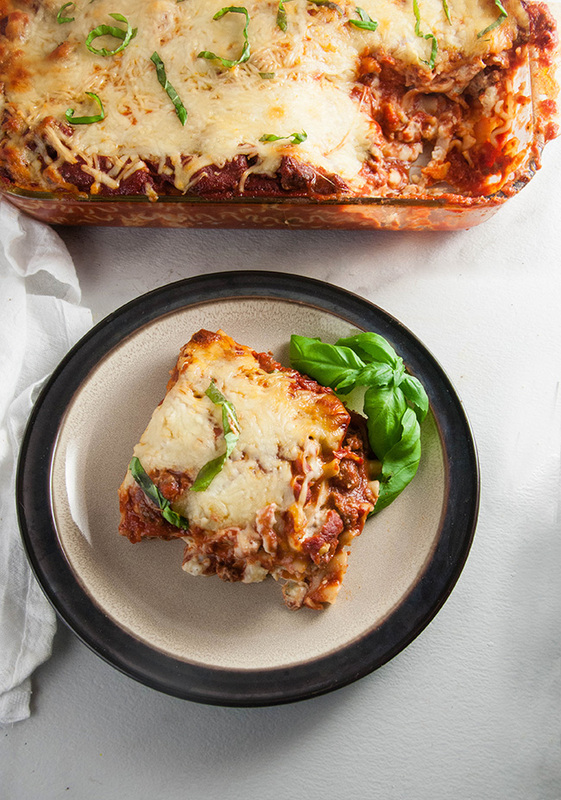 Lasagna is an Italian American holiday staple. Cook the lasagna noodles according to instructions on the package. While you are bringing the water to a boil, heat a tablespoon of olive oil over medium to medium high heat in a large pan. Add the ground beef and season with the basil, onion powder, garlic, red pepper flakes, and salt and pepper. Cook until the meat is brown between 7 and 10 minutes, stirring, and flipping the meat. When meat is cooked through, reduce heat to medium low and add the tomato puree. Let simmer until you are ready to put the lasagna together. After you have put the sauce together, start the cheese filling. 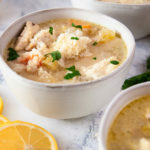 Add the ricotta, mozzarella, and Parmesan cheeses to a bowl. Season with fresh parsley, garlic powder, and salt and pepper. Stir together and taste. Add more seasoning if necessary. If the cheese is too dry, add an egg and mix it in. Set aside. Spray a rectangular 3 qt casserole dish with nonstick spray. Add a layer of meat sauce to the bottom of the tray. Lay 3 lasagna noodles on the meat sauce. Spoon on about half the cheese, spreading it evenly. Add another layer of sauce. Then layer on 3 more lasagna noodles. Spoon out the other half of the cheese. Spoon on more sauce. Layer the last 3 lasagna noodles on top of the layer of sauce. Cover with sauce. Sprinkle on the additional 1/2 cup of mozzarella and shredded Parmesan, covering the top of the lasagna. Bake in a 400 degree oven for about 20-25 minutes or until the cheese is melted and the sides of the sauce bubble. * I recommend making extra noodles in case some break or rip. 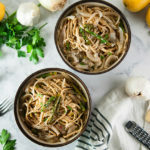 ** I used brown rice lasagna noodles to keep it gluten free. *** You may have some sauce left over. Serve on the side. That story about Goose is HILARIOUS! At least she knows her cheese 😉 And I love the idea of using rice noodles. 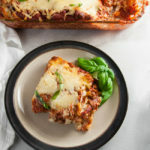 I haven’t had lasagna since my celiac diagnosis, so this looks right up my alley! Casey, I highly recommend the brown rice noodles. 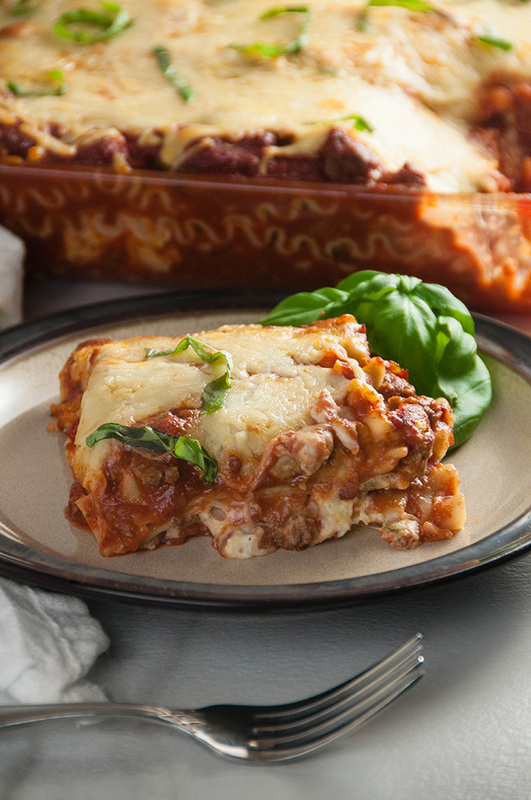 They hold up better than a lot of other gluten free varieties for a hearty dish like lasagna. I find them at Wegmans. Ah, this is great! I make gf stuff for the hubs. I’ll try it. Also, you could always try “veggie” noodles, like zucchini…i know not the same though lol. Lol funny you mention that. When I was discussing with my hubs which lasagna recipe to share, I mentioned doing my zucchini lasagna but ultimately decided to wait until zucchini season when we have massive zucchini in our garden. 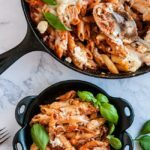 I recently decided to cut back on the amount of gluten i eat, simply to help with digestion and I’ve been on the hunt for a good pasta recipe. This looks so flavorful and delicious. I can’t wait to try it. 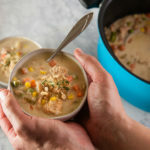 Hope you like this recipe. I do find the less gluten I eat the better I feel too. This is my kind of meal and I eat GF as well!! I totally agree that it gets a bad rap! Which is a shame because it is so easy to make extra and freeze for later. This looks fantastic! Mmm! Such a treat! I’m Italian, and of course we have lasagna at Christmas and Easter (and any other holiday)! In fact, my mom just asked me what kind we should make this year! Yours looks scrumptious! I would’ve loved to be in a family that made lasagna instead of ham for the holidays. Lol! This looks awesome and not one bit gluten-free. It wouldn’t last more than a day in my house. Your daughter’s right. Ricotta needs a LOT of cheese! LOL!